Get a free VX-351 with every Voyager order! Accept no substitutes! This is the genuine Minimoog, updated with all the modern necessities like midi control & patch saving while still retaining that massive 3 oscillator/ladder filter sound. 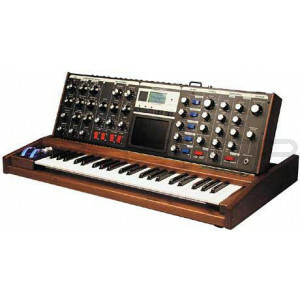 The new Minimoog is also far more versatile than its predecessor, featuring more modulators, more panel features, & a 3 dimensional touch screen to control it all. As a special bonus, all our voyagers have been fitted w/ illuminated, clear acrylic pitch bend and modulation wheels. Normally a $60 option, you get this classiest of upgrades for free when you buy now!